BLOG | Specializes in pre-ferments and long fermentation process to nurture the taste and to achieve the full nutritional potential of bread using what the nature has provided to his baker. BLOG – Specializes in pre-ferments and long fermentation process to nurture the taste and to achieve the full nutritional potential of bread using what the nature has provided to his baker. INFORMATION LIFTED FROM THE WWW. Gluten-free, but not without additives. Accused of many evils and more and more industrialised, the daily loaf of bread is now “dans la panade” – in a sticky situation. Some consumers are turning to gluten-free breads, seduced by “well-being” marketing campaign despite unrestricted regulation of ingredients. Consumed by personal needs or by fashion, these represent a potential market of more than 10 million consumers. Their test shows, quality of Gluten-Free breads are variable. Using the reference of The Country Bread, which is the most consumed behind the baguette, is defined with a slightly tangy, based on sourdough starter, commonly made with wheat flour or semi-wholegrain flour, with or without rye flour. But many gluten-free breads (ie. without wheat or rye flour) display the names “countryside”, “country”, “farmer” or other names referring to the same ideas of rusticity and authenticity. To compensate for the absence of the texturing properties of gluten; like a framework of proteins, to avoid a flat and compact loaf of “bread” – gluten-free “bread” manufacturers add oils, gums, emulsifiers, bamboo fibre, beetroot or potato … A bric-a-brac non-traditional ingredients and additives that move the Country Bread away from its original recipe. Because of special “modern” diet or intolerance to gluten (un-denatured protein), consumers of gluten-free breads opt out gluten, however, they are introducing additives, replacers and other unnecessary ingredients into their body. With or without gluten, the prepackaged industrial breads of their selection do not shine by the simplicity of their recipe. But they see that the number of gluten-free bread ingredients (18 on average, including 3 to 5 additives) is even greater than that of conventional prepackaged bread (around 10 and little or no additives) and some gums used to reproduce the effects of gluten (including the starch gelatinisation during baking) can cause intestinal discomfort in case of high consumption. In addition, emulsifiers are to be avoided, as some studies suspect them of promoting inflammatory bowel disease or diabetes. However, it is found in 9 of their 14 gluten-free breads and in only 1 of 11 conventional breads (La Boulangère). Finally, if the levels of salts and pesticides are satisfactory, almost all pre-packaged breads, whether with or without gluten, contain hidden sugar and added fat! Although conventional breads are not without flaws, it is clear that the composition of many gluten-free breads does not live up to their healthy image. Celiac people, who will have no choice but to go gluten-free, will find some good products in their selection, including fresh breads made in bakeries that are exclusively gluten-free. For others, it is better to opt for a conventional bread with simple ingredients and often much cheaper! BREAD IS NO LONGER HOW IT USED TO BE. Behind this professional term call “BAKER”, hides a multi-faceted craft skills whereby many of them depend on large milling companies/ groups who directly contribute to the standard consistency of the bread market and a technical system that weakens baker’s professional baking skills. For consumers, this is extremely difficult in identify and to make choices when it comes to buying bread. In France, for the past twenty years, the term “bakery (boulangerie)“ has been protected and is reserved for craft entrepreneurs who knead, shape and bake bread on the spot. This definition is among the most stringent in Europe whereby it prohibits any form of freezing the bread dough or freezing during its development process of the bread (Bake fresh from scratch). Despite these safeguards by legal definition of the term “BAKERY”, the situation has turned bakers foolish. With 35,000 establishments, the artisanal bakery remains the leading food retailing business in France, but every year nearly 1,000 independent bakeries shut the door due to rural desertification and the competition of industrial bread, which today accounts for 43% of the bread market in France. Therefore, today, independent bakeries who manages a single store is no longer sustainable. A new model among the competition has surfaced: the chain bakeries. Particularly sprouted in urban areas, chain bakeries like Marie Blachère, Louise and Ange (around 300, 120 and 60 shops respectively) play on two levels: bread made from scratch on-site, which allows the legal use of the terms like “BAKERY (BOULANGERIE)”, “HOMEMADE” and even “ARTISAN”. (In France, all these labels are legally defined to serve and protect traditions). However, chain-bakeries also use recipes offered by industrial premixes whereby they just need to mix, shape and continuously bake-out, proposing special offers “buy 3 get one free” and also danish pastries (croissants etc…) made partly in industrial factories whereby the chain-bakeries would thawed, proofed and baked on site. Sole proprietor bakers from the countryside and small towns are the first to suffer from these new breed of chain-bakeries, since they no longer have the appeal of yesteryear. The chains are strategically located in shopper traffic zones with ample parking lots, whereas the bakery in front of the sacred church has lost its flock. Many sole proprietor bakers have also developed a subordinate relationship with their suppliers: the millers; as some are now much more than flour suppliers. While flour groups share more than half of the market (see opposite), these companies have taken a dominant position that Marie Astier, author of the book <<What bread do we want?>>, Is largely responsible for consistency. Initially, however, everything started with a good intention: “In the late 80s, while the dominant model was the ultra-bleached white baguettes made mechanical, some millers wanted to enhance the quality of bread. It was the birth of the Banette milling group who offered bakers recipes combining a hand-shaped dough with so-call a more upscale flour, of which were promoted via local television ads. But, little by little, the bakers were deprived of their know-how. Until becoming, for some, as the technical operators of the millers more than of a craftsmen! In March 2018, <<Que Choisir Magazine>> came across on the grand booth of the <<Grands Moulins de Strasbourg>> (own by the group Egast) in an exhibition. The Fourth largest French miller, which has a partnership with Banette, owns eleven mills and the brand “Le Pain Boulanger (The Bread from the Baker)”. At the exhibition, they presented a concept bakery store in search for potential business partners. Like the practices of all major millers, the layout of the sales outlets, marketing and technical support, and even start-ups financing are now part of the services offered by the milling company. The latter also offer training to master the so-call “Home (Maison)“ recipes. “Turn-key” breads such as “Banette n ° 07”: a “well-being” bread with gluten-free leguminous flours, “Bousco”: described as “authentic bread with a good regional flavour… … One of those breads from yesteryear revealed by master bakers knew how to perpetuate the secret from generation to generation … “. Behind these concepts are “pre-mixes” – flour pre-mixes with additives (bread improvers, conditioners and inactive bread flavours) and, if necessary, various ingredients (seeds, dried fruits, goji berries or chia seeds …) – which the baker having signed a contract for such supplies could brand and create its own recipes. Today, an elite of bakers are raising the alarm. Among them, researchers, historians and associations study the virtues of natural leavens (sourdough) and ancient grains. Lovers of good bread list good bakeries (eg. blogger “Painrisian”, for example) and of course bakers, often from reconversion. Louis Lamour is one of them. A former financier turned baker in Bordeaux for ten years. “Without mix, with flour without additions and natural leaven,” he summarizes. For bread that tastes really different comes with a cost. Because making bread “the old way” is more expensive. As “Buying flour from a small miller costs three times more than that of an industrial miller who bleached and reconditioned the flour,” says Louis Lamour. 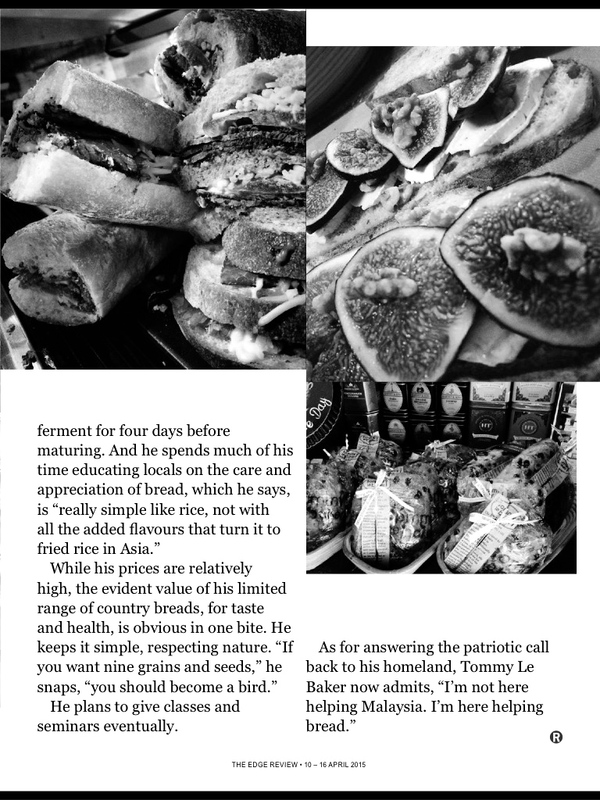 Seeking to strike the right balance, big-scale industrial bakeries and chain bakeries today would portray the baker as a “guardian of traditions” but insisted that he “is nonetheless an artisan of today.” The symbolic power of (good)will bridged the chasm between theory and practice. Central bread factories awash in wistfulness for “the rediscovered bakery [la boulangerie retrouvée]”, placed its ambitions in the same tradition of sensible marriage, evoking “a happy balance between the utilisation of perfected matériel and a perpetuation of certain gestures of “autrefois“. The evocation of l’ancienne was more often a “coup du décor” – a decorative ploy – than the harbinger of better bread. The original bread does not exist…. The fashion for the authentic is governed by the “authentoc” – gaudy imitation. Yet our confidence in the past as a guide to primal virtues seems boundless. The first bread I learnt to bake was the recipe called “Le Pain Courant” (The Daily Bread). Because of my language acquisition, and precision of french word employment, I would naturally be captured by the technicality of the words in the recipe. “Farine Panifiable”; naturally I would think is a flour that has been conditioned to make bread. I did ask my trainer, what is “ameliorant de pain”? His answer, a typical french boulanger was, IS A BAKER’S INSURANCE. To ensure what? I wondered. And one day i had a chance to work in an “Ameliorant” company and I was selling bread additives. The sales argument was “consistency”. For decades and generations, many baker’s fear was inconsistency in their baked goods hence the dependency of baking aids and improvers. To expand my knowledge on the field inwhich I am interested, Food Safety, I read a lot and extensively. Here is an extract of one publication written in February 1956 by The Food Protection Committee of the Food Nutrition Board, Washington D.C. (Some of the intentional additives mentioned in the report have been banned). Wheat flour, in its natural, freshly milled state, has a yellowish tint due to the presence of small quantities of carotenoid and other natural pigments. when such flour is stored it slowly becomes whiter and undergoes an aging process involving reactions with oxygen of the air which causes it to yield a satisfactorily elastic, stable dough of enhanced breadmaking quality. Until about 40 years ago it was necessary for the miller to age flour so that the baker could produce the type of loaf demanded by the consuming public. It was then discovered that certain oxidising agents incorporated into flour in very small amount would bring about rapid improvement in its colour and breadmaking properties, thereby lessening the storage costs and the hazards of spoilage and infestation with insects and rodents associated with long storage. Some of the permissible agents, such as the oxides of nitrogen and benzoyl peroxide, exert only a bleaching action and are without influence on baking properties. Others, such as chlorine dioxide, nitrosyl chloride, and chlorine, have both bleaching and maturing or improving properties. Potassium bromate has only a maturing effect. The maturing of flour is of much greater economic and practical significance than bleaching, which is practiced today chiefly because of the consumer preference for bread with creamy-white crumb. The flour milled from some threats requires very little oxidation, while that milled from wheat pf different varieties, or grown in other areas or in different crop years, may require substantially more oxidation to yield dough of satisfactory handling properties for mechanised baking and to produce bread of consistently goof quality. The maturing and bleaching agents help to smooth out the wide variations encountered in bread wheats and enable the miller to produce a standard and relatively uniform product. Bread improvers employed by the baking industry contain a small amount if a solid oxidising substance, e.g., potassium bromate , potassium iodate and calcium peroxide, and inorganic salts such as ammonium chloride, ammonium sulphate, calcium sulphate, sodium chloride, mono or diammonium phosphate, and mono-, di-, or tricalcium phosphates which serve as yeast foods and dough conditioners. Their use helps assure vigorous and even fermentation of the dough and enable the baker to produce bread of uniform quality. The use of maturing agents and oxidising improvers is of great economic value. It eliminates the costs and hazards associated with natural ageing and enables the baker to produce uniform baked goods with flour from new-crop wheat as soon as it is available. The widespread acceptance of these agents is illustrated by the fact that most of the bread and cake flours produced today are treated by the mills to improve their baking performance. In the production of quality cakes, highly refined, finely and uniformly granulated flour made from specially selected low protein wheat is required. This flour is bleached and matured with chlorine to produce tender cakes with colour, volume, and fine grain demanded by the consuming public. The quantities of these oxidising agents required to obtain the desired improvement in baking performance are small, and if more than one is used, correspondingly less off each agent is necessary. Excessive treatment gives inferior baked products; thus the treatment is self-limiting. Oh yes…the training institution where I was, is owned the miller. Many are into whole grains seeds in their daily bread and identify it as premium. Well, my objective planting bread in the rice field is to share the nature of the basic loaf in its taste and look. I agree mixing grains and seeds into bread is delicious, however, to reach the nutritional potential of many grains and seeds, pre-soaking them is very important. Most grains and seeds house a mineral inhibitor call phytic acid (please google it)! On the other hand, these loaves are usually rolled with the grains and seeds onto their crusts to increase their attractiveness. Most grains and seeds have good natural oils. Exposing to direct high oven temperature would alter the benefits of the oils. 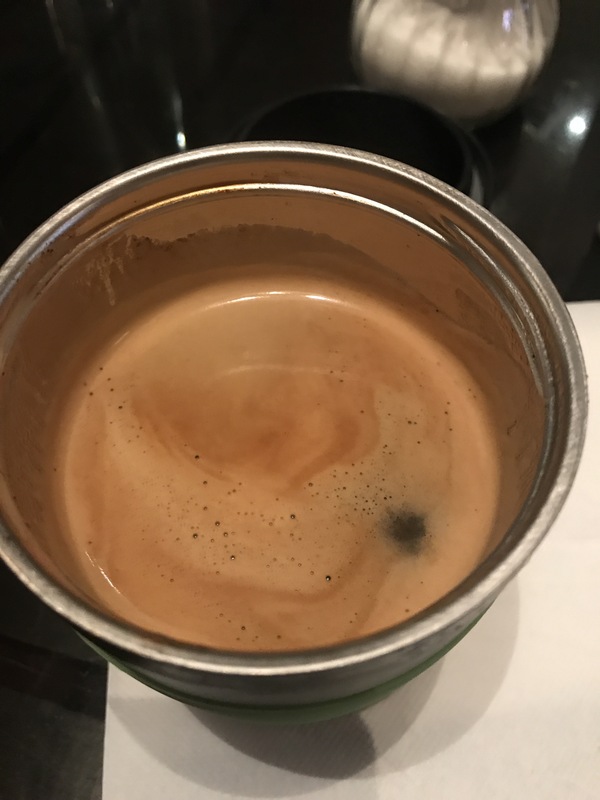 Kopi ah… kopi ah… coffeeeeeee why is it so difficult to make a basic cup of black zero calorie 100% coffee for me?? Not interested in your cupuccino, latte, la-kopi, la-whatever with milk, but mine is just a basic black 8oz of coffee in the morning. ME: hi, may I know how you prepare your long black? Barista: one shot espresso and hot water up to the size of the cup. Me: ok, and how do you prepare the americano? Barista: one shot espresso and hot water up to the size of a BIGGGER cup! Me: can you help me to prepare my black coffee the way I want it? Me: here..take a shot of ground coffee, press for coffee and let the water drip through the ground until the level of an 8oz cup. Barista: oh you want an espresso! Me: oh no, not that short a cup for my morning. Barista: oh so what’s the difference between our long black or americano and the way you want it? LONG BLACK (Cafe Allongé): pull the hot water out of the ground coffee. AMERICANO: add as much hot water as you like in a mug, bowl, basin…even into a pool…🤦‍♂️ (is a culture of holding on to coffee mugs and drinks it even when it’s cold). You are basically selling water passing through ground coffee. That’s it! I didn’t order hot water. So before your blood sucking cows milk sits too long on your revenue of coffee, get your straight black beans right with hot water. 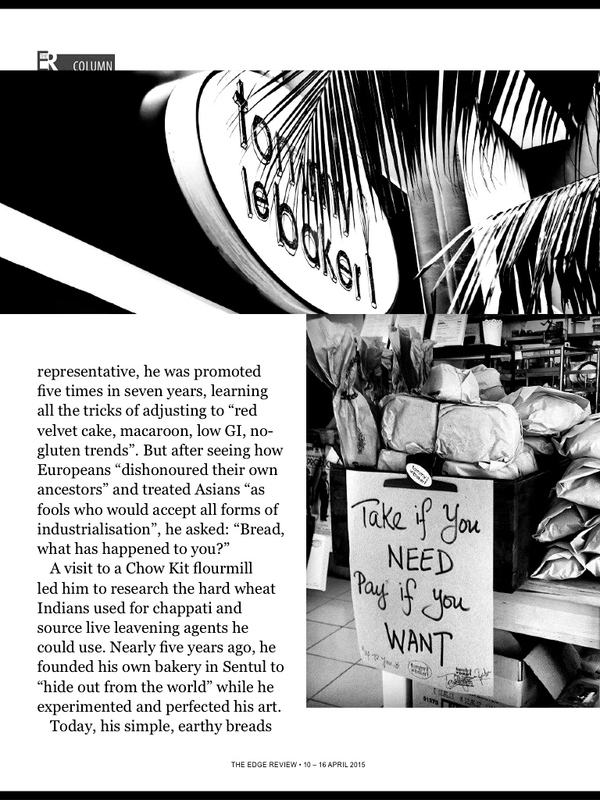 Will drop by Tommy le Bakery soon!” TLB: thank you, share your reading and thoughts on nutrition about bread here. Your knowledge might help me to look further on my work! Student: Sure. To be frank, I used to avoid bread cuz of the gluten and that mostly they are refined. N im stil unsure if wheat is really healthy and all. Till lately I learn about sourdough bread which the body can digest more easily. I will read up on your post to understand more in depth TLB: Gluten Hydrolysis and Depolymerization during bread fermentation is something I read and understand to cultivate my bread. Student: I see, so will it benefit ppl in any way in terms of nutrients? Or is it just a better alternative as compare to other bread out there? TLB: if we eat something that is largely pre-digested (not ONLY in bread), our gut don’t have to work so hard and hence reserve more time to digest other food we eat and absorb more varieties of nutrients. Student: Yes it’s true. Nice knowing people like u. TLB: Is promising to know students like you too! Student: How do you get so passionate about bread? TLB: I used to sell bread additives. I travel all over asia and beyond to work and consult in industrial bakeries. I know what ppl are suffering physically and mentally from bread. Having a sensitive knowledge in both industrial and artisan bread baking skills, I guess I took it up as a mission more than a passion. Student: To help the community is that right? TLB: help or not, I don’t know. But I think is important to raise awareness in what we choose to eat. Student: Do u give talk to the public? TLB: nope, I try to use social media. I don’t like ppl to listen to me, I prefer ppl to think with me. I am going to copy paste our conversation on my wall! Hope to gather more minds to look into this social issue on bread. Human Eat Bread, Birds Eat Seeds. I do not bake multi-seeded or multigrain breads. 240°C is the temperature of my bread oven. You Feed Us, We Feed You. This is a question from many of my customers everyday. And I have been trying very hard to find a way to reply. I look at every single loaf in my shelf and I ask them: Can “you” please tell me how I should reply to every single patron who might be bringing “you” home? 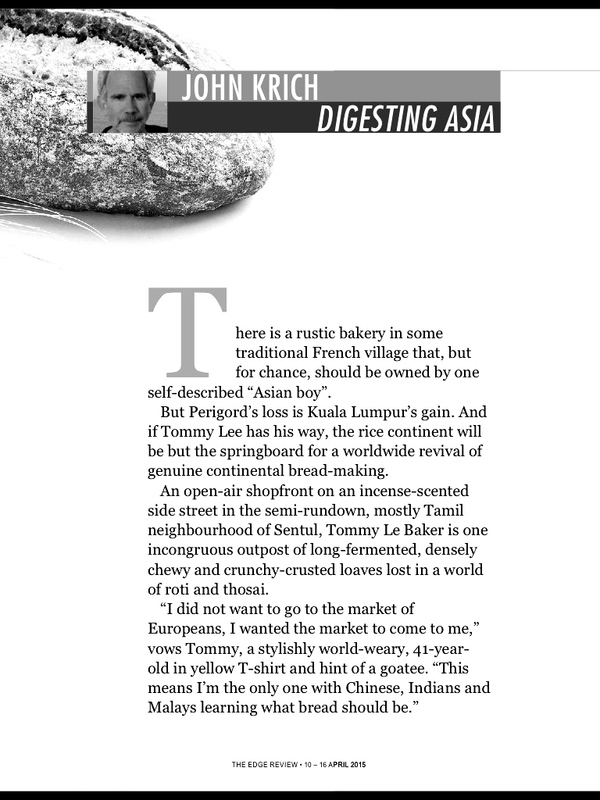 Bread: “Tommy, we have been nurtured, raised and baked here by you in your city. Your city folks have been introduced to bread that has brought great convenience to their lives for their economic and financial values. Bakers like you know how we naturally aged like every single human being. Listen carefully to their question again. Do you think this question can be applied to how we are raised and baked? Is a modern question; is a question from folks who have been raised and assured by the social convenience of modernization which leads to fear of wastage when they bring us home. We feel weird, we feel out of our natural context where we should be existing. However, it has never felt better in a context of being re-invited to be masticated by your patrons. Don’t worry, as long as you nurture our culture, raise us in your environment, let us do the rest…nobody can communicate the sense of taste better than us. We know who NEED us and who WANT us. We are sorry being so inconvenient for most of your patrons. However, is not only about us, is also about development of taste and time.